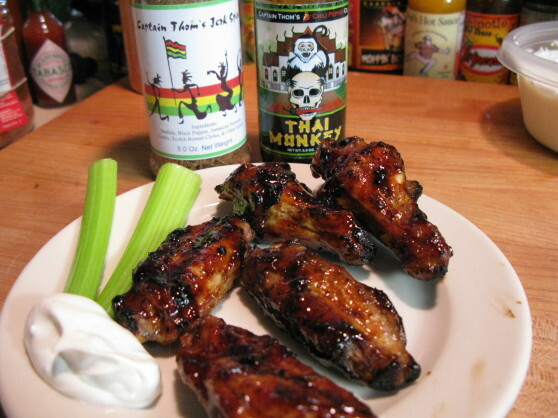 We already know this is a killer combo on chicken from an earlier experiment – Captain Thom’s Jerk Spice along with Captain Thom’s Thai Monkey Sauce on wings is big on flavor and spice with sweet heat and sticky wings to love! 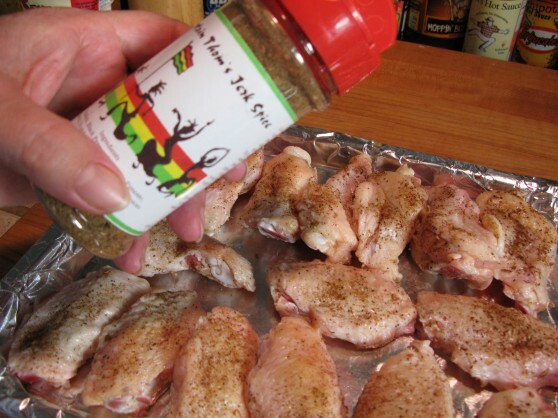 We simply sprinkled a generous amount of Captain Thom’s Jerk Spice on some wings. We grilled them for about 40 minutes – turning until crispy and brown. Then we pulled the wings off the grill and brushed Captain Thom’s Thai Monkey sauce on them. They are a delicious, sweet, savory “Asian – Jamaican” fusion of flavor. 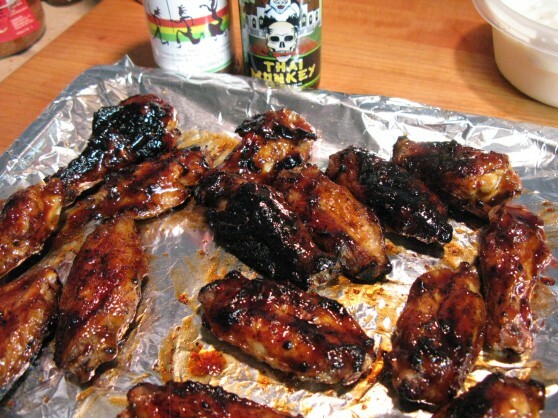 The spices in the Jerk Spice lend a good deal of heat, and the Teriyaki flavor of the Thai Monkey gives them a sticky and sweet glazed finish. 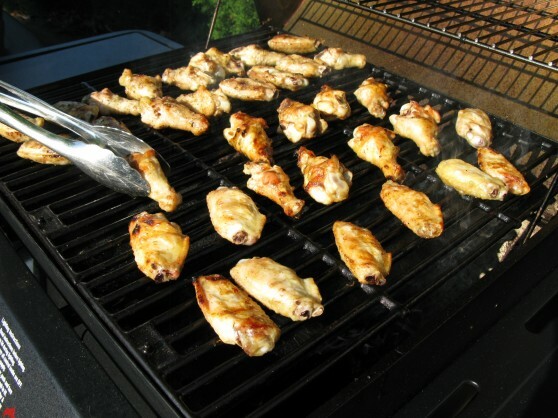 This combo has become one of our favorite wing recipes. We hope you get to try it soon! Thai Monkey sauce just sounds fun, doesn’t it? I might order some of both to try this. Your other recommendations have always paid off (sriracha wings, Chok on dis, etc, etc). I’ve been thinking for weeks about this but have finally decided that I will purchase both of these ingredients. Thanks for this article! Hey Robbie, you can’t go wrong. 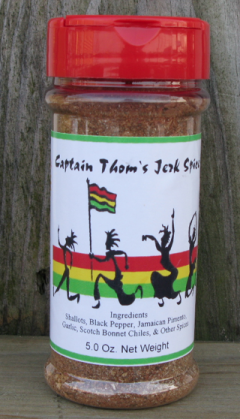 Capt Thom’s sauces and spices are Can’t Fail Good! Let us know how you like them. Well, I’m in awe. I ordered the spice and the sauce and finally tried them tonight. I didn’t think it would ever happen but these just took the crown of “Best Wings Ever! Anywhere!” in my house. Soundly capturing the throne from the venerable and much loved Sriracha Garlic wings by unanimous vote and lots of MMMMMM! These are So GOOOOD! from around the table. If you haven’t tried these, definitely get your Thai Monkey on. Hi Scott… glad you liked them. We are now calling them “Jerky Monkey” wings. The Sriracha Garlic are still our faves, but these are at #2. Stay tuned for even more “Jerky Monkey Jerk Thai Wings to Die For” goodness. We are so glad you tried our recipes, and promise a new one soon. Jerky Monkey. Of course! I know, I still really love the Sriracha too. BTW I tried that other Chinese Sriracha and it failed the taste test vs the original. I can send you some photos of the bottle if you’d like. These wings went over very well at work today. One of the guys was so estatic and loudly boasting about the flavor combination to all within earshot that you would have thought that he proudly cooked the wings himself. He’s an idiot anyway… We all hate him as much as we love the Jerky Monkey.